In one of the Icelanders’ sagas, Hrafnkel’s saga Freysgoða, we learn how important the horse Freyfaxi was to chieftain Hrafnkel: He axes his own shepherd Einar and keeps his promise that he will kill anyone who rides his horse without permission. The saga that is believed to have been written down in the second half of the 13th century, takes place in northeast Iceland in the early 900s. It is describing chieftain Hrafnkel as mild and fair towards his own men, but harsh against all others. It is written that Hrafnkel has a penchant for duels and that he never is willing to pay weregild (man price) for anyone he kills. The chieftain is also a deeply religious man and dedicates the best of his livestock to the god Freyr, including his horse, Freyfaxi (Old Norse: Frey’s horse). 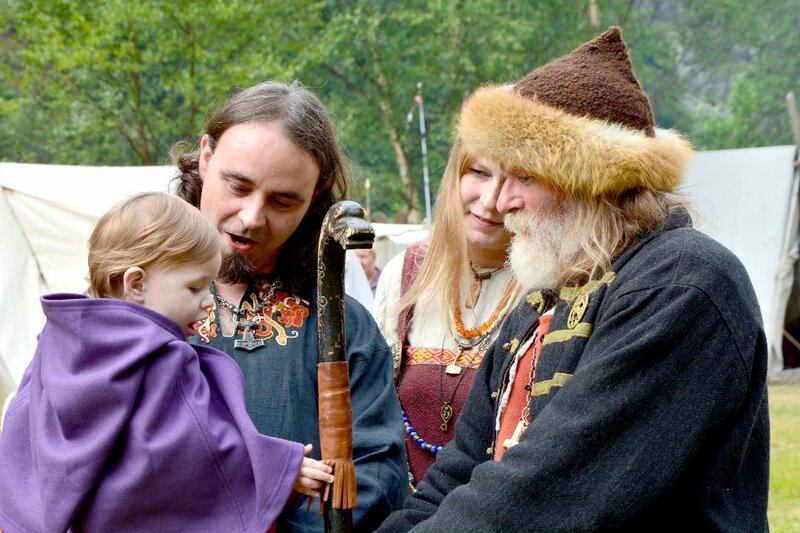 Due to his religious commitment, Hrafnkel is also known as Freysgoði (Old Norse: Frey’s priest and chieftain). The young boy Einar works as a shepherd on Hrafnkel’s mountain pasture farm. One day, when Einar gets trouble collecting the sheep, he needs to ride to perform his duties. He comes across a horse herd, but every horse he approaches runs away from him, except of Freyfaxi. Although Einar knows about the ban, he rides it hard the whole day until he has succeeded collecting all the sheep. When he lets Freyfaxi go, the horse immediately starts running back home. In the evening it arrives at Hrafnkel’s farm Aðalból and starts neighing. Hrafnkell realises what has happened when he sees Freyfaxi dirty and wet with sweat, and the next morning he rides up to the mountain farm where he meets Einar. After a brief exchange of words, the chieftain keeps his promise and reluctantly kills the shepherd with an ax. For this action, Hrafnkel is later convicted and declared an outlaw, and the rest of the saga is about his punishment, and the chieftain’s revenge. When Iceland was colonized in the late 800’s, the first original settlers like Hrafnkel’s father Hallfreður who arrived on the east coast around the year 900, brought with them horses from Western Norway. Freyfaxi was probably very similar to today’s Icelandic horse, a blend of Norwegian Viking horses and small horses taken from the British Isles. The Icelandic horses are tough and are performing well in a cold climate. Although, on average, they only are 140 centimeters (55 in) high and weighing 350 kilograms (770 lbs), they are both strong and steady and have no problems carrying an adult man (or Viking) in rough terrain. There are many references to horses from the Viking Age: horse carcasses, horse heads and equipment in graves and on sacrificial sites have been found. They are depicted on runestones, tapestries, jewelry – and are also featured in myths and sagas. From Norse mythology it can be mentioned Odin’s eight-legged horse Sleipnir, Heimdallr’s golden-maned horse Gulltoppr, the jötunn giant Hrungnir’s horse Gullfaxi, and Dagr’s (day) and Nótt’s (night) horses Skinfaxi and Hrímfaxi bringing daylight and night. We also have Frey’s horse that has supernatural powers, so it is perhaps not so strange that Hrafnkel respected his own promise that if someone did ride Freyfaxi without his permission, he would kill him. A promise he kept to the young shepherd Einar. Sources: arild-hauge.com, khm.uio.no, nihf.no, and more.